09 | March | 2011 | WHAT A FEELING! Certain true stories add up to more than just the random events of a particular place and time; they tattoo themselves onto the shared consciousness of an entire nation. Such a story is that of the notorious Chicago “Black Sox,” who threw the 1919 World Series. If you were ever a child who loved baseball, chances are you heard this story. If you heard it, you never forgot it. The Chicago White Sox of 1919 were heavily favored to win the series, but they lost, and in the months after the series, it was revealed that eight Chicago players were involved in a payoff to dump some games. All eight were banned from baseball forever. Director John Sayles (Return of the Secaucus Seven), who has been wanting to film this story for years, recognizes that there is much more in this tale than the tragedy of Eight Men Out (as the title of the movie has it, held over from Eliot Asinof’s book). The “Black Sox” scandal was a sharp disillusionment to the national character, a tear in the nationwide return to normalcy in the postwar years. 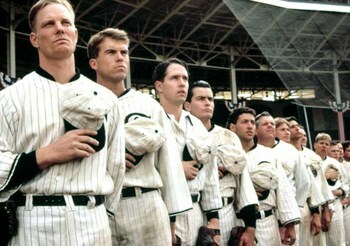 That moment is retained in Sayles’ film of Eight Men Out, which lovingly re-creates its era. Sayles skillfully sketches the circumstances that led to the players’ sellout, including the hard cheapness of Chicago owner Charles Comiskey, and the ruthlessness of the gamblers who set up the fix. The players are drawn into the fix with an offhandedness that belies the deep scar their actions would leave. It’s an ensemble piece, but Sayles gives special attention to three players: Jackson (D.B. Sweeney), the illiterate but gifted player who went along with the fix almost casually; Buck Weaver (John Cusack), who knew about the fix but did not participate in it, and was banished from baseball anyway; and Eddie Cicotte (David Strathairn), who saw the end of his career coming and agonizingly went along with the deal. The many characters fly by, but Sayles keeps them distinct. Sayles himself plays Ring Lardner, and writer Studs Terkel plays a fellow journalist. Other ballplayers are played by Charlie Sheen, Michael Rooker, James Read, and Don Harvey. John Mahoney does his usual excellent work as the team’s bewildered manager. Some of the sleazier money men are played by Kevin Tighe (he was also a meanie in Sayles’ Matewan), Michael Lerner, and Richard Edson. As opposed to the black-and-white world of greed and culpability in Matewan, Eight Men Out has no easy villains; everybody seems to have their reasons. The film is most poignant as a study of a few men who made a mistake, whose names were permanently blackened, and who wound up losing their livelihood and their joy. A fine job on a great American story, even if the film sometimes seems to have been made by a journalist dabbling in cinema. Aside from the tracing of national disillusionment, of course Sayles’ interest in the story had much to do with its portrait of the rift between ownership and labor, a tale that keeps re-telling itself (as it is right now in both the sports world—an NFL lockout looms—and an epic union-busting showdown in Wisconsin). When I said everybody had their reasons, it referred mostly to the players whose names were tarnished. The owners kept their jobs. You are currently browsing the WHAT A FEELING! blog archives for the day Wednesday, March 9th, 2011.